Hello Happy Times: 10 Tips : How to start a blog! 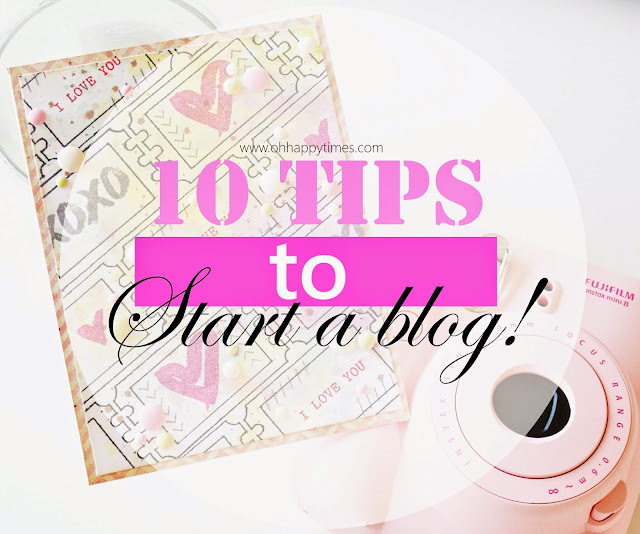 10 Tips : How to start a blog! Hi everyone! I will be sharing some tips to those of you who are planning to start a blog. :) This personal blog is pretty new but I started blogging since 2008. Know your content - You need to know what you love and passionate about. When you're making a post, you want to feel excited and happy in sharing stuff to your viewers and not feel like "blah" just because you have to. Think of a blog Name - Once you know what kind of content you want to share, then you can think of a blog name that feels right with what you will be sharing. Write down the names and choose the best! Choose your blogging Platform - This is easy, you can create it for free in blogger , wordpress ,etc. And it's up to you if you want a custom domain, you need to pay extra per year. Design your blog - Once your blog is set up, have fun designing it according to your own taste, there are so many free templates out there. Or simply use the one that you have in your platform. Create and Publish your first post! - Have fun and do your best always. Connect with other bloggers - Follow some blogs that you love, and leave comments, you'll also get notice by other bloggers who leaves comments on their post. Don't forget, to link back if you make a post about certain websites. Be consistent - Schedule your post ahead of time. New content every couple days or so will make your readers happy! And you will feel accomplished too! Keep on learning and have fun - Last but not the least. Never stop learning, it's the best! Have fun discovering new stuff and new content that you can share.